This tutorial walks through the deployment of a default, auto-generated Django website to an Elastic Beanstalk environment running Python 3.6. The tutorial uses the EB CLI as a deployment mechanism, but you can also use the AWS Management Console to deploy a ZIP file containing your project's contents. The EB CLI is an interactive command line interface written in Python that uses the Python SDK for AWS (boto). This tutorial uses SQLite, a simple database engine included in Python. The database is deployed with your project files. For production environments, we recommend that you use Amazon Relational Database Service (Amazon RDS), and that you separate it from your environment. For details, see Adding an Amazon RDS DB Instance to Your Python Application Environment. To use any Amazon Web Service (AWS), including Elastic Beanstalk, you need to have an AWS account and credentials. To learn more and to sign up, visit https://aws.amazon.com/. The Django framework will be installed as part of the tutorial. Creating environments with the EB CLI requires a service role. You can create a service role by creating an environment in the Elastic Beanstalk console. If you don't have a service role, the EB CLI attempts to create one when you run eb create. Create a virtual environment with virtualenv and use it to install Django and its dependencies. By using a virtual environment, you can discern exactly which packages are needed by your application so that the required packages are installed on the EC2 instances that are running your application. Create a virtual environment named eb-virt. You will see (eb-virt) prepended to your command prompt, indicating that you're in a virtual environment. The remainder of these instructions show the Linux command prompt in your home directory ~$. On Windows this is C:\Users\USERNAME>, where USERNAME is your Windows login name. Use pip to install Django. 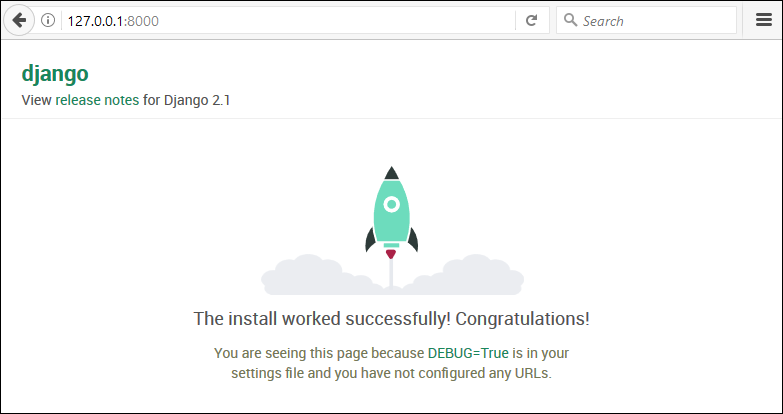 The Django version you install must be compatible with the Python version on the Elastic Beanstalk Python configuration that you choose for deploying your application. For deployment details, see Deploy Your Site With the EB CLI in this topic. For details on current Python configurations, see Python in the AWS Elastic Beanstalk Platforms document. For Django version compatibility with Python, see What Python version can I use with Django? This command lists all of the packages installed in your virtual environment. Later you will use the output of this command to configure your project for use with Elastic Beanstalk. Now you are ready to create a Django project and run it on your machine, using the virtual environment. You will see the (eb-virt) prefix to your command prompt, indicating that you're in a virtual environment. The remainder of these instructions show the Linux command prompt ~$ in your home directory and the Linux home directory ~/. On Windows these are C:\Users\USERNAME>, where USERNAME is your Windows login name. Now that you have a Django-powered site on your local machine, you can configure it for deployment with Elastic Beanstalk. By default, Elastic Beanstalk looks for a file called application.py to start your application. Since this doesn't exist in the Django project that you've created, some adjustment of your application's environment is necessary. You will also need to set environment variables so that your application's modules can be loaded. Elastic Beanstalk uses requirements.txt to determine which package to install on the EC2 instances that run your application. This setting, WSGIPath, specifies the location of the WSGI script that Elastic Beanstalk uses to start your application. Reactivate your virtual environment whenever you need to add additional packages to your application or run your application locally. Immediately after deployment, you'll edit Django's configuration to add the domain name that Elastic Beanstalk assigned to your application to Django's ALLOWED_HOSTS, and then you'll redeploy your application. This is a Django security requirement, designed to prevent HTTP Host header attacks. For details, see Host header validation. This command creates a new application named django-tutorial and configures your local repository to create environments with the latest Python 3.6 platform version. If you see a "service role required" error message, run eb create interactively (without specifying an environment name) and the EB CLI creates the role for you. This command creates a load balanced Elastic Beanstalk environment named django-env. Creating an environment takes about 5 minutes. As Elastic Beanstalk creates the resources necessary to run your application, it outputs informational messages that the EB CLI relays to your terminal. Your environment's domain name is the value of the CNAME property. Edit the settings.py file in the ebdjango directory, locate the ALLOWED_HOSTS setting, and then add your application's domain name that you found in the previous step to the setting's value. If you can't find this setting in the file, add it to a new line. Save the file, and then deploy your application by running eb deploy. When you run eb deploy, the EB CLI bundles up the contents of your project directory and deploys it to your environment. If you are using Git with your project, see Using the EB CLI with Git. This will open a browser window using the domain name created for your application. You should see the same Django website that you created and tested locally. 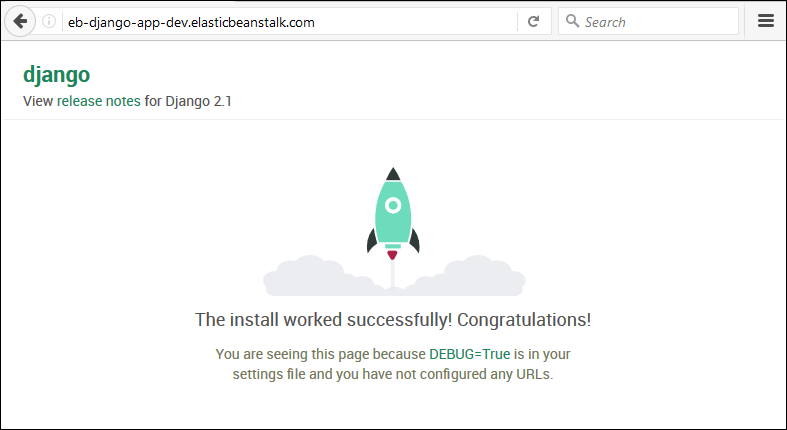 If you do see your application running, then congratulations, you've deployed your first Django application with Elastic Beanstalk! Now that you have a running application on Elastic Beanstalk, you can update and redeploy your application or its configuration and Elastic Beanstalk will take care of the work of updating your instances and starting your new application version. For this example, we'll enable Django's admin console and configure a few other settings. By default, your Django web site uses the UTC time zone to display time. You can change this by specifying a time zone in settings.py. For a list of time zones, visit this page. 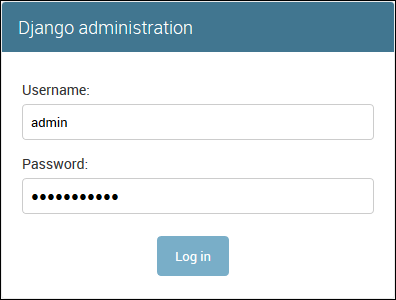 You can create a site administrator for your Django application to access the admin console directly from the web site. Administrator login details are stored securely in the local database image included in the default project that Django generates. You can use a similar procedure of local updating/testing followed by eb deploy. Elastic Beanstalk takes care of the work of updating your live servers, so you can focus on application development instead of server administration! You can add commands to your .ebextensions script that will be run when your site is updated. This allows you to automatically generate database migrations. This configuration file runs the django-admin.py migrate command during the deployment process, prior to starting your application. Because it runs prior to the application starting, you must also configure the DJANGO_SETTINGS_MODULE environment variable explicitly (usually wsgi.py takes care of this for you during startup). Specifying leader_only: true in the command ensures that it is run only once when you're deploying to multiple instances. This command terminates the environment and all of the AWS resources that run within it. It does not delete the application, however, so you can always create more environments with the same configuration by running eb create again. For more information on EB CLI commands, see Managing Elastic Beanstalk Environments with the EB CLI. For more information about Django, including an in-depth tutorial, visit the official documentation. If you'd like to try out another Python web framework, check out Deploying a Flask Application to AWS Elastic Beanstalk.